Welcome again to Exposure to Fabricated Wahhabism. 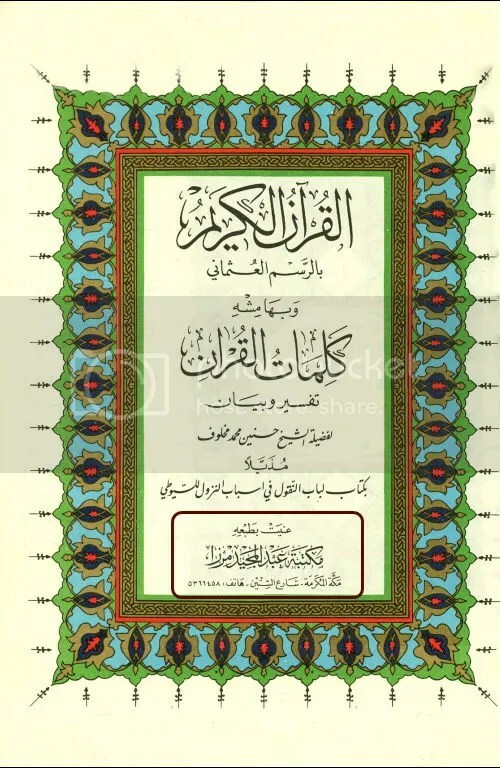 As several times we presented many books in which these so called (Salfi, na-ahluhadith or Wahhabism) which are full of fabrications , editing and taken in and out many things from authentic literature. Today we have a question for Wahhabism to decide what would you call it? It would be called Editing Covertly, or with full intention. 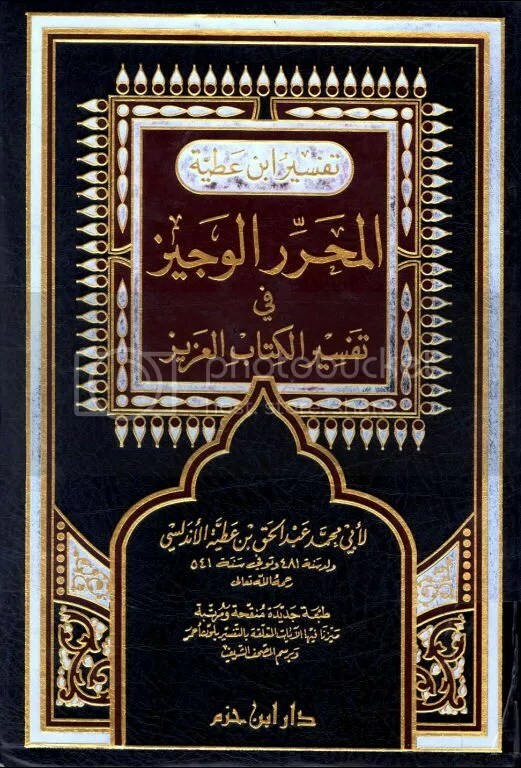 Tafsir name is Al Muharar al wajeez fi Tafsirel Kitabel Aziz (tafsir ibne Attia) published by famous Dar ibn Hazam. 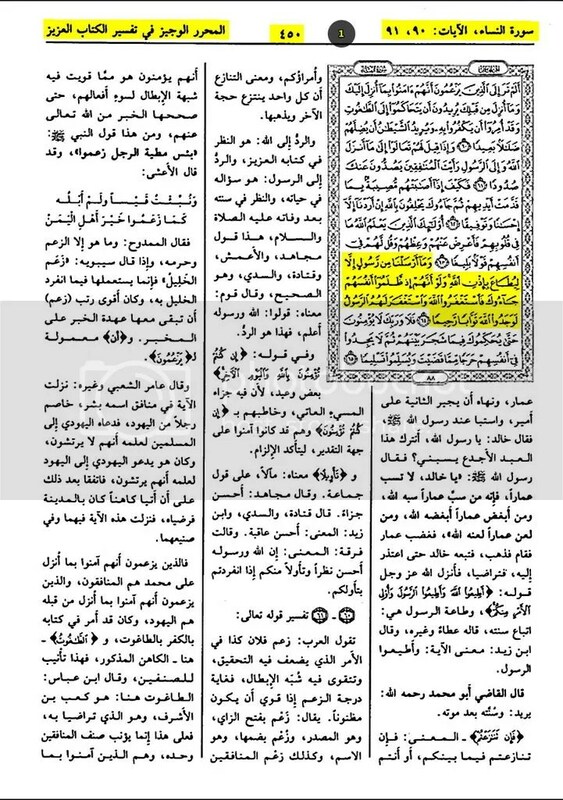 In this tafsir Picture (1) , which shows Surah al Nisa Verse 64 (yellowed lines on right), on page 450 as you can see this verse totally shows Tawasul Waseela Madad of Prophet alehisalatowasalam. This means this holy verse of Quran is showing and guiding us the way to take intercession of the Prophet alehisalatowasalam in the Lordship of Allah when we commit some sin. Interestingly they on Page 449 it shows verses 39 to 40 or something but on this page 450, publisher has written Surah al Nisa al -Aayaat 90 and 91. Now is it a mistake or intentionally cheating to avoid one’s mind from reading such verse in detail? Another thing on this same page 450 (1) there is no exegesis (Tafsir) of this single verse in this whole page. They totally removed it, i had checked page 451 for that, may be here they could have mention it, but still on that page i did not find Tafseer of that verse but on page 452 i found out that, they started tafseer of Verse 63 and 64 too, but when they reach to the words. “And We did not send any Noble Messenger except that he be obeyed by Allah’s command; and if they, when they have wronged their own souls, [ come humbly to you (O Dear Prophet Muhammad peace and blessings be upon him) and seek forgiveness from Allah, and the Noble Messenger intercedes for them,] they will certainly find Allah as the Most Acceptor Of Repentance, the Most Merciful“. Now here is the game. They only did exegesis of the words til, when they have wronged themselves….. the rest…….. has been gone, they even didnt explain the tafsir of this full verse, they only chose some part of the verse for exegesis and left important piece from that verse alone. Is it by Mistake only? Let me show you another Wahhabi Publisher of Makka and their “Beautiful Work“. 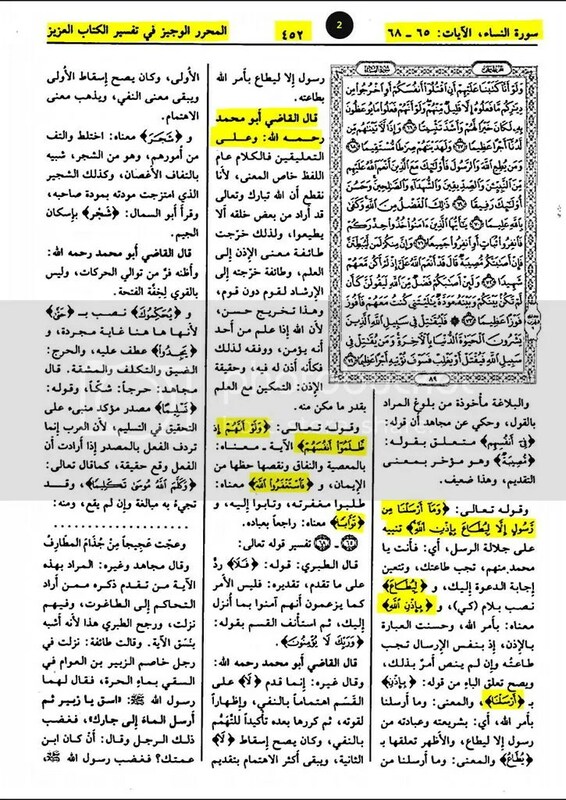 Now check that, the same verse which is published in this another Wahhabism’s Published Tafsir. The Same verse’s exegsis will not be found, though as its been marked by red circles, you will find that, verse 60, 61, is mentioned then, 62/63 and 64 is not mentioned and directly 65 and 66 is been presented, further, their hashiya is also does not showing anything about the verse. 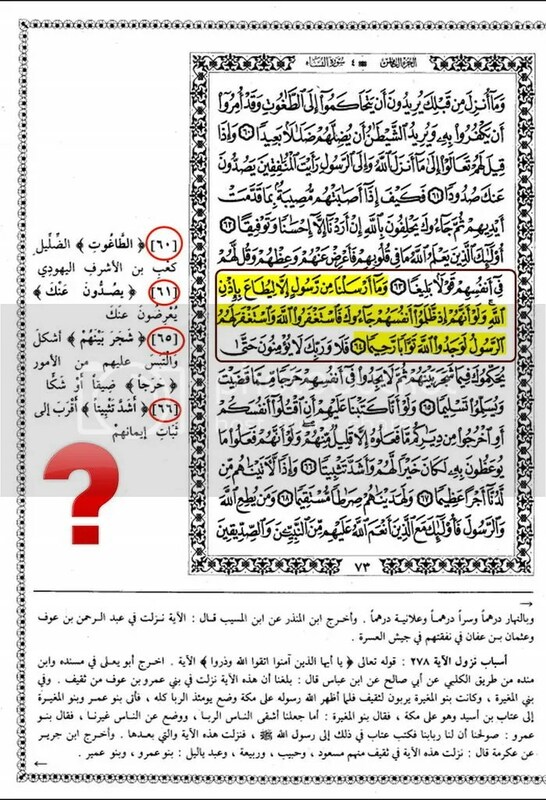 This is a serious crime, tell us please could we call it fabrication in Tafaasirs (exegsis) of Holy Quran, or only Publishing mistake? If it is only mistake then why this mistake happens with only Wahhabi Publishing Agencies? Why only in Wahhabi tafseers you will get such kind of things along with the books of ahadith hmmm? Why is then all these book openly distributed on internet hmmm? Is it spreading Islam or is it fabricating Islam? Be a Muslim when you answer this question. May Allah save us from Such Misguided People. Aameen. May Allah A’azzah Wa Jal protect all Muslims from this wahabi fitna. May Allah Tabarak Wa Ta’ala with the sadaqua of our Master Sayyidina Rasool’Allah Sallallahu A’laihi Wa Sallam shower His choicest gifts upon you all for being so delligent in this very critically important matter. Keep up the good fight. The Prophet Muhammad warned us of this fitna and we must remain Honourable and courageous enough to keep exposing these liars. Granted some are mixed in the whitewash by coincidence or ignorance but at their roots, they are the vilest of humanity. Shahr Mubarak inshallah.